My son has a friendship with water that started where else but in the bathtub. From the moment he could sit up on his own he became a slippery bundle of laughter and splashes. Sharks, turtles, and a rubber ducky taught him to squirt Mommy even though she scowled. The first time he wiggled on his tummy in the tub, shouts of "Daddy! I'm swimming!" echoed around the bathroom. When Daddy came in to see, the water sprite shrieked, “I got you!” and soaked Daddy's pants. The joy of staying wet means getting out of the bath after "two more minutes!" turns into five, and the shark and the boat have time to squirt the wall again. When the water starts to gurgle down the drain I hear, "Where it going?" and always wonder if I should say, "To the ocean." Summer vacations at the coast gave him new water words: beach, crash, and wave. He liked to yell, “Throw it, Daddy!” and watch his daddy throw rocks and shells into the ocean to make them splunk and disappear. From his first summer visit at age one, to the latest at age three, he’s been fascinated with the ocean. I imagine he dreams of whales when we leave the window open at night to hear the aquatic lullaby. Sand in his diaper, wind, cloudy skies—nothing keeps him from crawling, tottering, and running in the sand to touch the water of the big, blue sea. At home when we are far from any ocean—landlocked, dusty, and dry—my son asks to “drive really fast” to get there. Without an ocean we settle for dancing in occasional rainstorms, wading in the backyard pool, and playing Pooh Sticks with pinecones racing through the culvert under our favorite path. When summer storms flood our street, my son collects sticks, pinecones, acorns, and leaves—his mini gondolas to navigate the raindrop river. The moment he notices the water out the window he begs to march into it. The big kids slosh their galoshes up and down the curb and my son follows. His friend across the street comes to wade and chase and scream too. They don't mind the wet clothes and cold fingers. When it hasn’t rained for days and the sun screams heat on our heads, we set out the pool and have stick-boat races. Water cannot sit idle at our house. During the winter, bath time becomes my son’s main way to keep wet. Sometimes it just isn’t enough. One night last winter my son, settled into bed, stretched an open hand up over his head in the dim light. He turned it back and forth, looking it over as if for the first time. He began to talk about the water-spraying elephant statues at the zoo. "I want to get my sweeve wet at efulents," my boy whispered. "Wait for summer," I told him. I pictured the fun he would have as a little efulent, trumpeting water over his back. This summer I decided my son needed more water than could fill a tub or wading pool. My husband and I don’t swim, but we want our son to learn, so I signed him up for a two-week parent/child swimming class. I thought he’d take to it like a whale, diving and spouting water all over me. We visited the pool before lessons started, to let him explore. He loved it, bravely going in as deep as his waist, laughing and splashing just as I had guessed he would. But when lessons began a few weeks later, he showed me quite fiercely that they were not according to his terms. I feared I would scare the love of water out of him, and he would dry up. Each day we struggled into the swim clothes while I prepped him for swimming with little mantras of “I’m so proud of you for trying!” and “You are so brave!” My husband even bribed him with ice cream. Fortunately, he always smiled at some point in each lesson, always went in the water of his own free will, and always made progress. He stayed friends with water, and I think I see signs of a bold swimmer yet. Just when I thought our water days were at an end for the season, I found myself saying yes to a family-floating adventure down the Boise River. My husband invited me to go along with some friends, thinking I’d want to get a sitter for our son. It was too last-minute to get someone to watch him, so I worriedly imagined us huddled in our raft in the middle of the river with our son screaming to go home. Would he get scared or would he love it? But how could I have doubted our water-obsessed child! Clad in a lifejacket, he clawed his way over the side of the raft time after time, wanting to dangle in the water while I held him by his armpits. And the only screams of the two-hour float were exuberant joy with many a “WHOA!” as we faced the few small rapids. Even when his friend showed fear, my son only wanted more water to fill the boat. 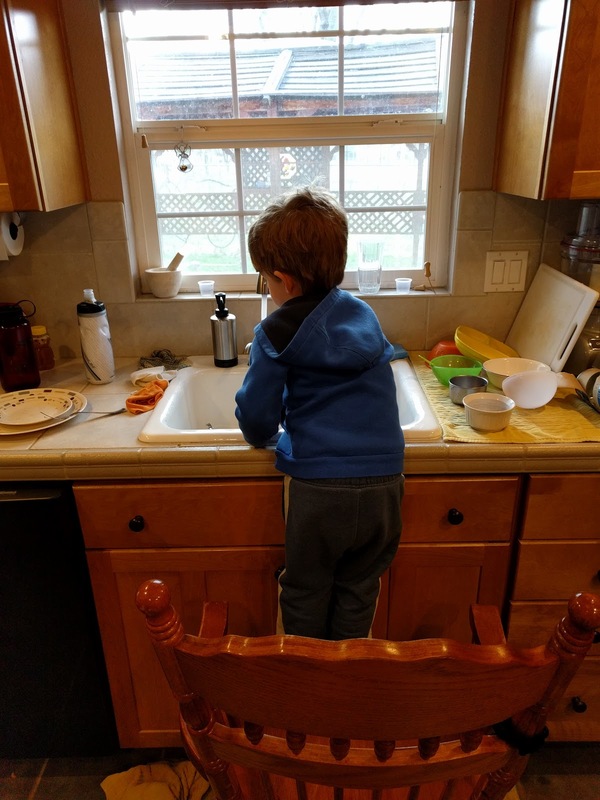 Lately, when we can’t get outside to dance in the rain, go to the river, or pull out the wading pool, my son delights in the water of the kitchen sink. He drags a chair, scraping across the floor, and parks it in front of the sink where he spends time filling and dumping cups and bowls of water. 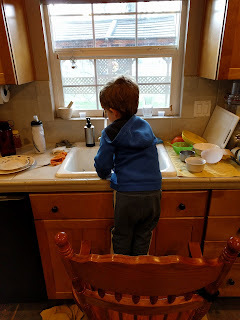 As I sit here writing he exclaims, “Mommy, there’s a lot of dishes to do!” He may not always want to do the dishes, but I have no doubt we’ll be chasing water for many years to come.